Howdy, I’ve been meaning to write this article up for quite some time now but couldn’t get the words together right. So in the end I just said “F*&K IT “and just write what ever and see what comes out! 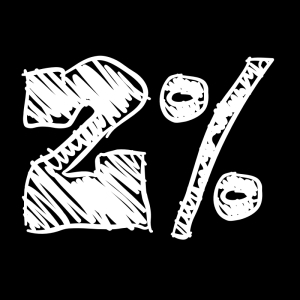 What’s all this 2% nonsense all about then? you know what craziness i’m on about. However, as most of you ain’t i’ll elaborate some more. and how I apply them to “sounds” aka. Bass/Drums/FX/Pads etc. In the past if i was to process drums i would apply a VST like Camelphat or SDRR etc and go for the real “obvious” presets. Presets that would change my “drums” from LAME drums to “NOISIA” like drums! I would do the same when i came to processing BASS as well. OK… sometimes its 3 or 5% better! But that takes quite an amazing plugin, however thats all subjective anyways. OK, so what plugins am I taking about? 1. Ableton Live Saturator. Great sound. 2. Slate VCC. Yes you need Ilok but it does what i’m talking about perfectly. Sometimes its more like 1% but it adds up! 3. Kush Audio Clariphonic. Damn Ilok! Another great plugin. Seriously sweet high end sparkle. 4. Waves Aphex Exciter. Again another high end sparkle type of plugin but boy is it nice. 5. Camelphat. Well this is kind of obvious. The Tube Warmth and Big Drums presets are brilliant. 6. Ableton Live Glue Compressor.Wonderful. The saturation is superb. 7. UAD Dangerous BAX. Beautiful sweet high and low end manipulation. 8. UAD Shadow Hills. Mastering Grade compression for a reason. Absolutely wonderful. 9. Slate VTM and VBC. Should have just said all the Slates. Wonderful. 10. Plugin Alliance Elysia Comp. This plugin is gold. The Saturation is rugged but in a good way. Just works like a compressor should. 11. UAD 1176 and LA2A Collection. You can run sound through those and not do anything and shiz just sounds “better”. Well, there is more but I’ll stop there. That’s enough for most to get cracking. Use and abuse this technique. Its an easy thing to add to your workflow as well. The great thing about this technique is if you go too far with the plugins you’ll know because it will sound “CRAP” so then you just undo and voila all will be good in the world. So let me know how you go with the 2%. Am i nuts? Am i crazy? Am i wrong? Is this the most inane technique you’ve ever read? Let me know in the comments below. Till then.